Understanding tax regulation can be challenging at the best of times. In much of Latin America, rules around withholding taxes on B2B transactions vary so greatly it can dramatically hinder efficient business. This fact is especially concerning when it comes to the consequences of non-compliance. For example, in Argentina, failure to pay withholding taxes can result in hefty fines of up to 10 times the amount not paid. Effectively managing B2B transactions, therefore, is of the essence.Doing so, however, requires an in-depth understanding of the individual, country-specific regulations that govern each jurisdiction. World Finance spoke to Ana Paula Maciel, Tax Content Manager at leading tax solutions firm Vertex, and Ernesto Levy, Senior Leader of Global Indirect Tax at Intuit, to find out more about how Argentina, Brazil and Mexico differ in regulations, and what businesses can do to streamline their processes. In Maciel’s words: “Withholding tax is a government requirement for the buyer of goods or services to deduct a specific amount from the payment made to the supplier.” However, what sounds simple in theory is far more complex in reality, especially when various external factors – such as the various levels of government at play (federal, provincial and municipal) and frequently changing rules – are taken into consideration. 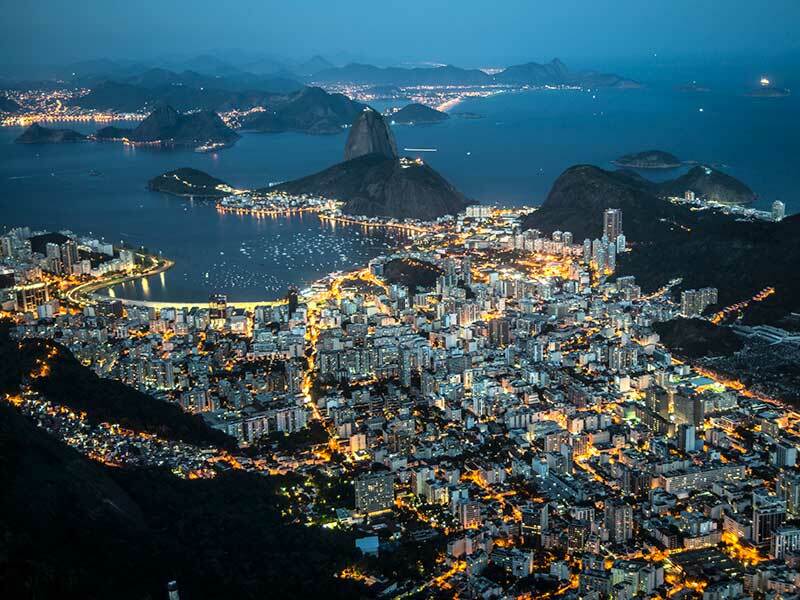 When it comes to withholding, Brazil and Argentina are two of the most complex countries in the world. This is not helped by the fact that, in the latter country, a collection regime also applies, whereby the seller is mandated by the government to collect an advanced payment of taxes from the buyer at the time of invoicing. Then there are the various regulations within each government level: on the federal side, almost all goods and services are subject to withholding income tax, and the majority of registered taxpayers are required to act as withholding tax agents. There are, however, some exemptions, including chargebacks, currency exchange transactions and payments made to government institutions. When it comes to VAT withholding, rates in Argentina vary depending on the type of goods or services being supplied – ranging from 50 percent on the sale of goods and certain construction services, up to 100 percent for ‘blacklisted’ taxpayers identified as high risk by the authority. While this sounds confusing, things get even trickier at the provincial level. 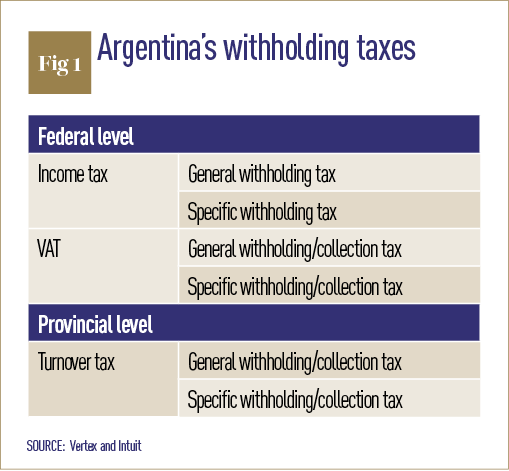 According to Maciel: “At this level, Argentina’s approach to withholding and collection taxes applied to turnover tax qualifies as complex.” There are 24 autonomous tax jurisdictions, and each one handles withholding and collection taxes based on a unique set of regulations. There are then various exemptions to consider; certain transactions may be excluded under different provincial tax regimes. In some cases, sales of capital goods are excluded from withholding and collection taxes, for example. The country is home to more than 80 different taxes. Those on VAT include: IPI, a federal tax on manufactured goods; PIS, a federal contribution applied to corporate gross revenues and used for the government’s social integration programme; COFINS, which funds social security and is applied to monthly invoicing; ICMS, which is a state value-added tax on the circulation of goods, interstate and intercity transportation and communication services; and ISS, a municipal service tax applied on services provided to a third party. Those on the corporate tax side include: IRPJ, a corporate income tax calculated on a company’s gross income; CSSL, a social contribution tax on net profit; and INSS, or National Institute of Social Security contributions, calculated on employees’ monthly salaries. The location of the transaction and its participants can also affect the status. The ISS tax in particular can vary depending on the city and service. In general, if the acquirer’s location requires the ISS tax, that city releases the ISS payment. However, there are rare situations where the two cities may understand that the ISS should be retained, and so the ISS is not paid. Fortunately, Mexico has simplified things a little: it’s primarily income tax and VAT transactions that are subject to a withholding regime, making its regulations at least a little easier to navigate than the country’s South American counterparts. Here, income tax withholding generally applies to payments made from entities to individuals for professional services. These local entities operate as the withholding tax agent and, as with Argentina and Brazil, withholding is triggered upon payment. The withholding tax rate is 10 percent, and it’s applied to the net amount of the transaction. There are nevertheless still a few niggling details that companies need to navigate around. Transactions between local entities aren’t usually subject to VAT withholding, but for those that are, the rates vary – for example, from four percent for ground transportation of goods, to 16 percent for scrap to be used as raw material or sold. Independent personal and commission services, meanwhile, demand a payment of 10.67 percent. All of these rates are normally applied to the net amount, but in some circumstances come off the VAT amount. Software platforms such as those offered by Vertex can help simplify systems and take the pressure off the companies themselves. Although the platforms can’t control the changes themselves, they can help organisations react to them. That’s well worth noting during a period of flux, when regulations are, according to Maciel, likely to undergo a series of rapid changes. This is expected to be the case over the coming years – but whether that’s for better or for worse remains to be seen.